It’s a common question typically asked only during training and testing: “If you lose your engine, where are you going to land?” As a result, we only reinforce the common belief that we are the safest pilots we’ll ever be the moment after training and testing has been completed. News travels fast and just as quickly as we hear about a plane making an off-airport landing (or crash) we can no longer find that same article as it’s been replaced by other news. Some of these events are very memorable, such as the Miracle on the Hudson, while others are less memorable but just as successful. This article isn’t about reminiscing on the good, the bad, and the deadly aspect of off-airport landings. Instead, let’s look at a few key factors to keep in mind if that unlucky day ever happens and you find yourself quietly gliding with seemingly nowhere to go. The higher you are; the more options you have. A common phrase we all have heard is “altitude is your friend”. Think of altitude as your bank of potential energy. The higher you are, the larger your potential energy account grows. This growth in potential energy increases your engine-out footprint, giving you more options to reach a desirable landing site if your number is called and you need to cash out that account. When possible, avoid unnecessary lengths of time in critical areas such as the first one thousand feet after lift-off, or reaching pattern altitude several miles outside of an airport. Ever practice a long-landing at an airport? Did it feel weird not having a PAPI/VASI or touchdown zone markings to help you out? You’re not alone. Practice spot landings. Practice them over and over to different aiming points on a runway (provided you have a safe runway distance remaining of course). If you aren’t practicing landings using an aiming point, then you cannot realistically land on that soccer field or Par 3 fairway you hope to reach during a real emergency. “Soccer field? Fairway? Those can’t possibly be long enough to land a plane on.” For most GA aircraft, probably not. But you can certainly decelerate your aircraft so that the impact at the end is survivable. 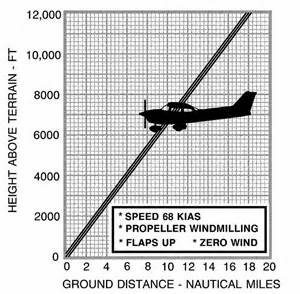 Would you rather land on a spot at 60kts, decelerate to 30kts and then impact or would you prefer to impact something at 60kts from the get-go? The longer amount of time it takes your body to decelerate from a given speed to a stop, the greater chances you have to survive. This is exactly the purpose of airbags in automobiles: stretching out the deceleration of a mass (aka, your body) as it comes to an abrupt stop. “But if I crash my plane into trees at the end of a golf course, my plane will be totaled.” So what? Planes are replaceable, your life is not. Worrying about saving your aircraft is a recipe for burnt toast. Let the aircraft’s design serve its purpose. It’s already failed you if your engine quits or a fire has erupted. It’s no longer your friend, it’s just a tool to help you get on the ground to fly another day. Every off-airport landing situation is different and unique. As such, there is no magic checklist to help you ace the event if it does happen. However, understanding and applying the above can prep your mind and your motor skills to be better prepared for that “unique” day that hopefully never happens.